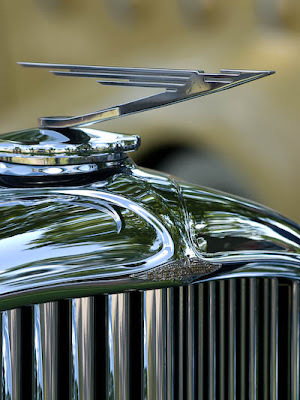 This is shot of the hood ornament (mascot) of a 1935 Duesenberg Model JN. This particular Duesenberg was a gift to Clark Gable from his wife, Carole Lombard. The Duesenberg was one of many fine automobiles on display at the 2008 Concours d'Elegance held at Meadowbrook Hall in Rochester Hills, Michigan. The background of this shot is actually a 1934 LaSalle owned by auto executive Robert Lutz. Shooting cars in the 'wild' is always a challenge. You have to deal with crowds, weather, distracting reflections, etc. An ideal day for shooting would be overcast where the light is even. Unfortunately the day of the event the weather was too nice, blue skies and no clouds. When I took this shot, the car was under some trees so the lighting was a bit more diffuse, but there were still plenty of reflections to deal with. As you can see in the 'as shot' image below, there was quite a bit of green reflecting in the chrome. The nice thing is that the curve of the chrome helped make the reflections a bit more abstract. You can make out the sky and trees, but you don't see a lot of people or defined shapes. My first attempt at processing involved simply using Lightroom 2 to do all the adjustments. I increased the blacks a bit, increased contrast and got an image that was quite nice. However, the more I looked at the image the more I thought that a black & white conversion would produce a better image. For one thing, it would make the images in the reflection a bit more abstract. I also thought it would focus the eye more on the details themselves rather than the color. To the left you see the layers palette for the black & white conversion. There wasn't much processing needed. 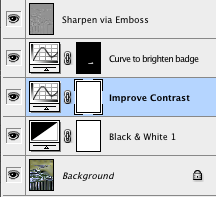 I started with a basic black & white adjustment layer. I lightened the background a bit and darkened some of the grillework. After the basic conversion, I added a curves adjustment layer to increase the contrast. 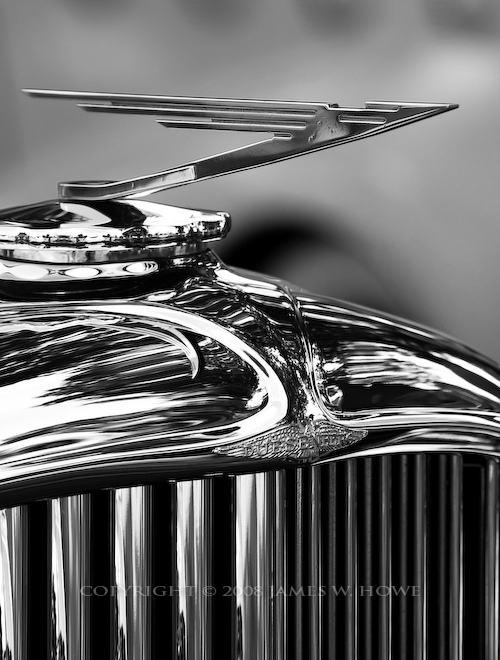 I also wanted to bring out the Duesenberg badge so I added another curves layer which dramatically lightened the image. I used a layer mask to mask out all but the badge. I finished things up by using the Emboss filter in Overlay mode to sharpen the image. This image is available for purchase in my Black & White gallery at ImageKind.